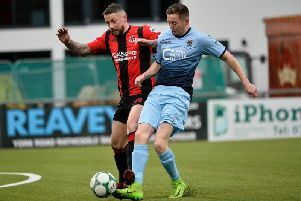 Newry City AFC moved a point above Ards and off the bottom of the Danske Bank Premiership table with a comprehensive 3-0 home win. Goals from Stephen Hughes, Mark McCabe and Tiernan Rushe saw Darren Mullen’s men win for the first time since Novmeber. Declan Carville headed a free-kick into the box on 11 minutes and McCabe cleverly laid the ball back for Hughes to break the deadlock. Darren King fired a low drive into the side-netting before Mark Hughes released Stefan Lavery, who out-paced Adam McAleenan on the left before playing it low to the near post for a McCabe finish. Before the break, with Newry in control, Stephen Hughes fired just wide of the left-hand post from distance. Ards’ sole first-half chance came in stoppage time when Eamon McAllister shot tamely at Newry keeper Andy Coleman. Ards goalkeeper Sam Johnston produced saves on two occasions inside the opening 15 minutes of the second half. The first when Dale Montgomery’s clever free-kick was curled low round the wall then, on 57 minutes, substitute Tiernan Rushe broke clear down the left and his lifted effort was excellently tipped over the bar. But Rushe did make it three 20 minutes from time when he curled a wonderful free-kick into the top corner. McCabe forced another stop by Johnston before Stephen Hughes’ dipping volley was just over. Johnston kept the gap at 3-0 with a late penalty save, his eighth spot-kick stop of the season, to deny Montgomery following a foul on Mark Hughes.